Originally published under the title, "'Reform' in Turkey." Thirteen years after coming to power on a platform of broadening civil liberties, the only "liberties" that have been broadened by Recep Tayyip Erdogan pertain to reactionary religious practices, like the right of his wife to wear an Islamic headscarf wherever she pleases. When formerly militant Islamists reflagged themselves as pro-European Union reformists and came to power in Turkey in 2002, they launched a propaganda campaign to send one single message to liberal Turks and a suspicious West: "Don't be afraid. We are here to broaden civil liberties." They were right, at least partially: They were there to broaden civil liberties -- but for devout Muslims only. The ruling Justice and Development Party (AKP) passionately (and quite sensibly) asserted that a campus ban on the Islamic headscarf must be lifted because it violated a girl student's right to dress as she deems fit. What was wrong if a student wears a garment that manifests her faith? Right? Right. So far, so good. There was a minor problem, though: The AKP was never interested in broadening universal liberties, on campus or elsewhere; its mission was to broaden liberties for the devout Sunni majority and restrict those for everyone else. True, no one who does not want to wear a headscarf must wear one, but Erdogan & Co. have never hidden their contempt for modern attire for women. A few weeks ago, Erdogan said, "Let them stubbornly [defend] their mini-skirts and cleavage... We shall keep working to raise generations loyal to their faith and history. The AKP was never interested in broadening universal liberties, on campus or elsewhere. In 2010, the AKP-controlled Higher Education Board sent a letter to a university warning the administration that "no student is to be dismissed from class or face disciplinary action due to any attire." It was explicit support for the headscarf. Fine. Meanwhile, very short skirts may either breach dress codes or face "neighborhood pressure." Just recently, a high school teacher told her students that if they did not cover their heads, they deserved to be raped. Non-Muslim symbols are not banned, but no one has ever been seen sporting one. Again, "neighborhood pressure." However, there is more -- having nothing to do with attire. Only one example was sufficient to unmask the AKP's understanding of "freedoms": Freedom for the headscarf and every manifestation of piety, jail for dissent. Berna Yilmaz and Ferhat Tüzer spent 19 months in jail for displaying a banner demanding free education. In 2009, during one of [then] Prime Minister Recep Tayyip Erdogan's public speeches, two university students, Berna Yilmaz and Ferhat Tüzer, held up a placard saying: "We don't want self-paid education." They were jailed for 19 months awaiting trial on charges of being members of a terrorist organization. In the fall of 2010, only a few days before the government moved to end the campus ban on the headscarf, a group of university students outside a campus building where (then) President Abdullah Gul was speaking, displayed placards that read, "We want free education," and "Freedom for Berna and Ferhat." As usual, the police intervened with excessive use of force and detained the protesters. The pattern has only worsened since then. As Turkey's Islamists have consolidated power by winning election after election, they have thrown away their masks, which are no longer needed to pretend they are pro-reform liberal Muslims. Intimidation through the police power of the state has become routine practice to suppress any voice of criticism or dissent. 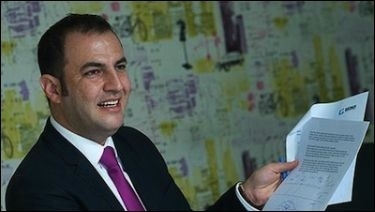 In 2012, another presumably autonomous but AKP-controlled watchdog, the one that oversees broadcasting, fined a TV station on the allegation that a particular episode of "The Simpsons" it had aired "made fun of God; featured a character who abuses another's religious beliefs; insulted religious beliefs; and it even encouraged alcohol consumption." In 2013, world-renowned Turkish pianist Fazil Say was sentenced to a suspended 10-month prison term for tweeting that: "Wherever there is jack-off, (a) cheap-jack, (a) thief, (a) jester, all are Allahists;" and for re-tweeting the famous verses from 12th century Persian polymath Omar Khayyam, that: "You say rivers of wine flow in heaven; is heaven a tavern for you? You say two heavenly virgins await each believer in heaven; is heaven a brothel for you?" Recently, a Turkish pollster was raided by inspectors from the Finance Ministry, two days after releasing its latest public opinion poll showing support for the AKP had fallen below 40%. The results came three and a half months before the country goes to parliamentary elections, on June 7. The offices of Murat Gezici's research firm were raided after it released polling data last month showing a decline in public support for the AKP. Murat Gezici, owner of the Gezici Research Company, said that inspectors came to his office on Feb. 24 and checked the company's financial records, contracts, employees and even part-time surveyors. They did not find any irregularities. Gezici added, however, that it was not a routine inspection. He claimed that the ruling party, uncomfortable with his company's findings, wanted to intimidate his company and stop the release of similar polling data in the future. In early March, a Turkish court blocked access to the website of the country's first atheist association. In its ruling, the court said that the website was an "insult to religious values." The court also said that the website of Ateizm Dernegi (Atheist Society), founded in Istanbul in 2014, was engaged in "activities likely to disturb public order." Yet the members of the Atheist Society should feel lucky. A ban on their website is a relatively civilized response from the ruling Islamists. God forbid, a crazy Turk may think a punishment "à la Charlie Hebdo" would better suit these infidels. As elsewhere, the Turkish Islamists are programmed to cheat a naïve Western audience eager to be cheated: Islamists too can be "pro-reform" and liberal pluralists who advocate freedoms for all. In reality, "freedoms" in the Islamists' dictionary means freedoms only for the Islamists. The Islamic headscarf is free in Turkey. The country is not.